WOU Facilities Services strives to be one of the most trusted partners on Campus. The Facilities Services Department oversees all of Western Oregon University's facilities and grounds including Auxiliary and Athletic facilities. Facilities Services provides daily support by maintaining and supporting safe, comfortable, sustainable, and efficient facilities. We also manage capital projects, design, development and space management needs. We directly support the WOU strategic plan. 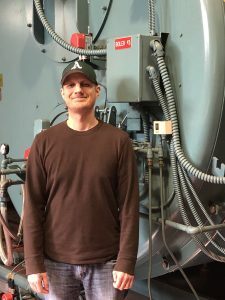 Brian has been working at Western Oregon University for 5 years. He manages the HVAC control system on campus, which helps maintain building temperatures and humidity. One of Brian's favorite things about working on campus is being able to help make people comfortable in their classrooms and work spaces through heating and cooling. He also enjoys all of the people he gets to meet and interact with on a daily basis here at WOU. Recently, Brian has been involved in the planning stages of the projects that will be taking place in the Administration, ITC, and OMA buildings. Long term, he hopes to see more sustainability initiatives come to fruition at WOU. In his spare time, Brian loves to go on hikes. His favorite trails can be found in the Beazell Forest of Kings Valley.